Cookie's Embroidery and Sewing Creations: Un-Clutter Your Life, then focus on the sewing room! 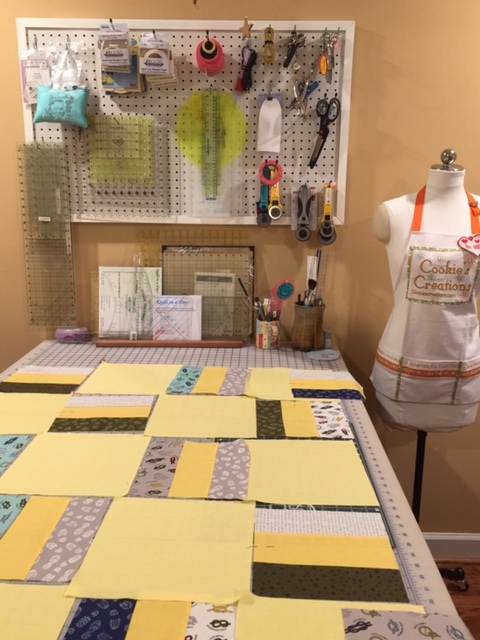 Un-Clutter Your Life, then focus on the sewing room! The best way to organize anything in your life is to discard the things you do not need. This can include material items, unnecessary expenses, time commitments, and unsupportive relationships (such as the “friend” who judges you constantly or a relationship wherein you and the other hold discrepant core values). The list goes on and on. I realized in 2016 that I had a lot of "stuff" that added no real value to the relationships and life goals that matter most to me. Do you have ‘things’ stopping you from achieving your goals and keeping you out of alignment with your core values? Here's an example from my own life: I wanted to change the direction of my blog yet there were commitments that kept getting in the way. In the process of traveling for RNK, I took time off from CookiesCreations.com to really look at my value system and examine whether or not those each item that required my personal or professional time aligned with these values. Yes, I still filled orders, but blogging, newsletters and posts took a backseat while I sorted and discarded items and commitments that did not line up with a short list of values. I started small and have continued to refine my list. My short list: family and friend relationships, helping others, and a career that aligns well with personal core values. Identifying your core values provides you with a road-map to becoming your best self and makes it easier to identify that which you are better off discarding. I'm not implying that it’s easy to decline commitments or to let go of things; however, it is easier to say no to things once you recognize that they do not reflect your values and life priorities. Wisely setting limits also saves you from later feelings of resentment when commitments build up, clutter accumulates, and social engagements become unnecessarily draining. I love sharing embroidery, sewing and quilting skills with others. I enjoy teaching and my position with RNK supports this value. I hate clutter in the sewing room and in all areas of my life. When there is clutter on my desk, I can't think. When there is clutter in my email, I get derailed from my task at hand. Taking the necessary time to set up mail filters has streamlined my inbox and allows me to stay focused. Keeping the tools of the trade organized on a peg board in view is better than searching through drawers. It's more productive to spend time with people who share many of the same values (That doesn't mean people who think differently should not be friends. I am talking about core values). Before removing clutter and organizing your own sewing space, make a list of your core values and the order of what matters most to you. If you love to sew, this will free up time to make this aspect of your life wonderful and improve all the areas that matter most. Schedule in your sewing time as you would other appointments and watch your creativity become unleashed.